Our “Dancing on a Cloud” effect is an event-ready, low-lying fog machine that creates thick clouds that hug the floor without the need for dry ice. The onboard ultrasonic agitator converts distilled water into a thin mist. The unit’s fast heat up time allows for quick operation and fog on demand. Our “Dancing on a Cloud” effect will not rise above 3 feet off the floor and dissolves cleanly leaving absolutely nothing behind. 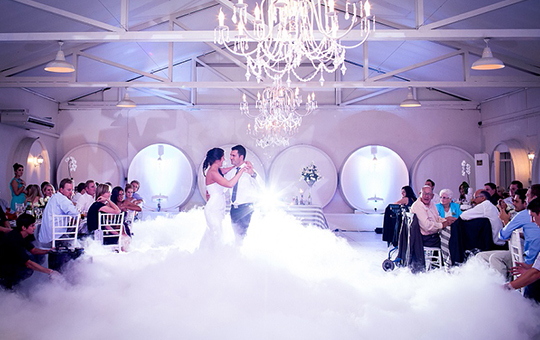 Our “Dancing on a Cloud” effect is great for adding a dramatic look to any dance floor for that special dance. Our “Dancing on a Cloud” effect will also look great in any photography or video as it gives the illusion that you are dancing in the clouds. PLEASE NOTE: Our “Dancing on a Cloud” effect is NOT a standard fog machine. Many venues forbid conventional fog machines as they set off fire sprinklers and can fill a room with an excessive amount of fog. We would like to emphasize that this means we can furnish this feature when many of our competitors can not.